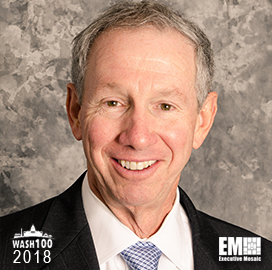 Executive Mosaic is pleased to announce Michael Griffin, undersecretary for research and engineering at the Department of Defense, as an inductee into the 2019 edition of the Wash100 — Executive Mosaic’s annual selection of the most influential voices in the government contracting arena — for his commitment to advance the country’s space programs and energy weapon systems. This latest honor marks Griffin’s second consecutive win. In October, Griffin suggested that the DoD establish an agency to supervise future development of the nation’s space programs. Deputy Defense Secretary and fellow 2019 Wash100 Award winner Patrick Shanahan asked Griffin and Heather Wilson, secretary of the U.S. Air Force and another fellow 2019 Wash100 winner, to create proposals for a possible agency in early 2019. The new organization would accelerate space projects, leverage commercial technology platforms and help to address military innovation challenges. Griffin said the Pentagon needs to expedite its acquisition process to remain competitive against potential adversaries in areas outside of space technology. He noted the Dgital Engineering Strategy will work to help federal agencies implement modern approaches to build weapons systems. He urged the U.S. government advance its development of directed energy weapons in the maritime, ground, space and air sectors. In November, DoD began seeking ways to expand its budget for directed-energy weapons for missile defense operations in the future and those investments in missile defense would focus on “laser scaling” in technology. As a part of the department’s reorganization plan in 2017, the Trump Administration appointed Griffin to be the undersecretary of defense for research and engineering based on his excellence in space policy acquisition and defense innovation. Previously, Griffin served as the chairman and chief executive officer of Schafter Corporation. He held executive roles with NASA, Magelian Systems, In-Q-Tel and served as the space department head at the John Hopkins University Applied Physics Laboratory. Griffin is a member of the National Academy of Engineering and the International Academy of Astronautics, a former president of the American Institute of Aeronautics and Astronautics and a senior member of the Institute of Electrical and Electronic Engineers. He received many awards including the NASA Exceptional Achievement Medal, the Rotary National Award for Space Achievement, the Missile Defense Agency Ronald Reagan Award and the Department of Defense Distinguished Public Service Medal, the highest award a non-government employee can receive. Executive Mosaic congratulates Michael Griffin for receiving this award.